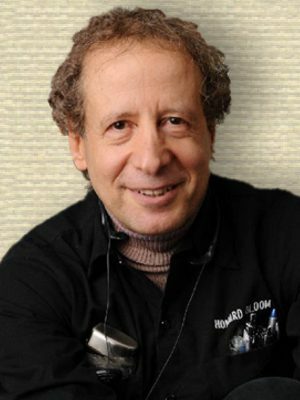 American science writer whose books include The Genius of the Beast (2010), The Global Brain (2000), and The Lucifer Principle (1995). A collective learning machine achieves its feats by using five elements … (1) conformity enforcers; (2) diversity generators; (3) inner-judges; (4) resource shifters; and (5) intergroup tournaments. In 'From Social Synapses to Social Ganglions', Global Brain: The Evolution of Mass Mind from the Big Bang to the 21st Century (2000), 42. Almost every reality you “know” at any given second is a mere ghost held in memory. In 'Reality is a Shared Hallucination', Global Brain: The Evolution of Mass Mind from the Big Bang to the 21st Century (2000), 72. Ancient stars in their death throes spat out atoms like iron which this universe had never known. 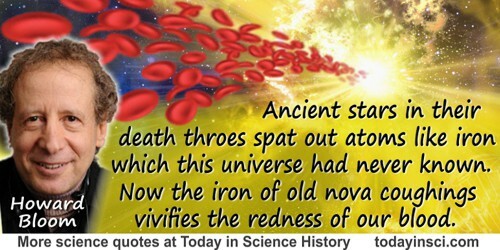 ... Now the iron of old nova coughings vivifies the redness of our blood. Global Brain: The Evolution of Mass Mind from the Big Bang to the 21st century (2003), 223. Quoted in Rob Brezsny, Pronoia Is the Antidote for Paranoia (2005), 228. By 1999, over 880 studies suggested that some mutations might … be genetic alterations “custom tailored” to overcome emergencies. In 'From Social Synapses to Social Ganglions', Global Brain: The Evolution of Mass Mind from the Big Bang to the 21st Century (2000), 44. From a few basic rules you can generate a cosmos. In The God Problem: How a Godless Cosmos Creates (2012), 24. Humor is a conformity enforcer clothed in the garb of congeniality. It focuses on others’ weaknesses, disasters, stupidities, and abnormalities. In 'The Conformity Police', Global Brain: The Evolution of Mass Mind from the Big Bang to the 21st Century (2000), 87. In 'The Embryonic Meme', Global Brain: The Evolution of Mass Mind from the Big Bang to the 21st Century (2000), 34. In a strange way, Marcion understood the situation better than the more conventional followers of the church, for Lucifer is merely one of the faces of a larger force. Evil is a by-product, a component, of creation. In 'Who is Lucifer? ', The Lucifer Principle: A Scientific Expedition Into the Forces of History (1997), 2. In the Vienna of the late 1920s and 1930s there throve an internationally famous philosophical bunch called the logical positivists. … They said that a key ingredient of knowledge was “sense data,” and proclaimed emphatically, in the words of … J.S.L. Gilmour, that sense data are “objective and unalterable.” …Good guess, but no cigar! In 'A Trip Through the Perception Factory', Global Brain: The Evolution of Mass Mind from the Big Bang to the 21st Century (2000), 64. Individual perception untainted by others’ influence does not exist. In 'Reality is a Shared Hallucination', Global Brain: The Evolution of Mass Mind from the Big Bang to the 21st Century (2000), 71. Men and animals do not merely struggle to maintain their individual existence; they are members of larger social groups. And, all too often, it is the social unit, not the individual, whose survival comes first. In 'The Clint Eastwood Conundrum', The Lucifer Principle: A Scientific Expedition Into the Forces of History (1997), 7. In 'Creative Nets in the Precambrian Era', Global Brain: The Evolution of Mass Mind from the Big Bang to the 21st Century (2000), 17. Remember a networked learning machine’s most basic rule: strengthen the connections to those who succeed, weaken them to those who fail. In 'The Conformity Police', Global Brain: The Evolution of Mass Mind from the Big Bang to the 21st Century (2000), 83. Sociological researchers maintain a mask of objectivity. But … when students in these movements report facts that contradict the tenets of their group's creed, they are … punished for their heresy. … forcing them “to leave the movement.” A similar mechanism of repression is at work in every scientific discipline that I know. In 'The Conformity Police', Global Brain: The Evolution of Mass Mind from the Big Bang to the 21st Century (2000), 86. The first two rules of science are: 1. The truth at any price including the price of your life. 2. Look at things right under your nose as if you’ve never seen them before, then proceed from there. In The God Problem: How a Godless Cosmos Creates (2012), 16. The greatest human evils are not those that individuals perform in private, the tiny transgressions against some arbitrary social standard we call sins. The ultimate evils are the mass murders that occur in revolution and war, the large-scale savageries that arise when one agglomeration of humans tries to dominate another: the deeds of the social group. … only group efforts can save us from the sporadic insanities of the group. In 'Creative Nets in the Precambrian Era', Global Brain: The Evolution of Mass Mind from the Big Bang to the 21st Century (2000), 18-19. The notion that individualism came first runs against the very grain of cosmic history. … grouping has been inherent in evolution since the first quarks joined to form neutrons and protons. Similarly, replicators—RNA, DNA, and genes—have always worked in teams… The bacteria of 3.5 billion years ago were creatures of the crowd. So were the trilobites and echinoderms of the Cambrian age. The ultimate repository of herd influence is language—a device which not only condenses the opinions of those with whom we share a common vocabulary, but sums up the perceptual approach of swarms who have passed on. Through our sentences and paragraphs long-gone ghosts still have their say within the collective mind. In 'Reality is a Shared Hallucination', Global Brain: The Evolution of Mass Mind from the Big Bang to the 21st Century (2000), 80. We must build a picture of the human soul that works. … a recognition that the enemy is within us and that Nature has placed it there. … for a reason. And we must understand that reason to outwit her. In 'Who is Lucifer? ', The Lucifer Principle: A Scientific Expedition Into the Forces of History (1997), 4. When Richard Dawkins first published his idea of a meme, he made it clear he was speaking of “a unit of imitation” … Memes were supposed to be exclusive triumphs of humanity. But memes come in two different kinds—behavioral and verbal. … behavioral memes began brain-hopping long before there were such things as human minds. In 'Threading a New Tapestry', Global Brain: The Evolution of Mass Mind from the Big Bang to the 21st Century (2000), 62. When you and I were born, only one thing was certain about the rest of our lives: that you and I would someday die. Just as a trillion, trillion, trillion (1036) microorganisms, animals and plants have died before us. … A God who slaughters is no God at all. Or if he i … He is a God who must be stopped. In The God Problem: How a Godless Cosmos Creates (2012), 19. When you repeat an old pattern in a new location, you sometimes make something new.